Visible Logic got Health Literacy Partners off the ground by developing their branding including their name, logo and web site. Initially, the owner took developing and sending the e-newsletter, and used our Mail on the Mark platform and the Do-It-Yourself service. Eventually, our client decided to turn over the e-newsletter to Visible Logic. 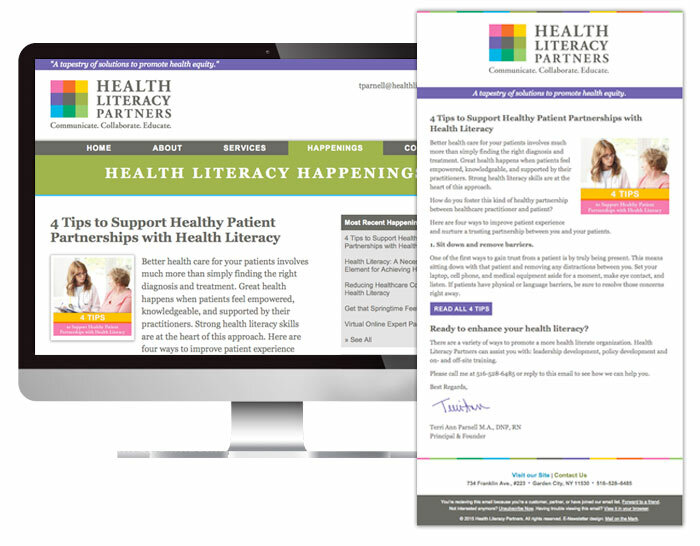 We added a blog onto the Health Literacy Partners WordPress-based web site and developed a content marketing strategy. By using both the blog and an e-newsletter we are able to improve SEO and keep top of mind with known prospects.